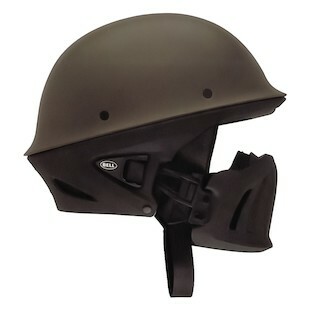 2013 Bell Rogue Helmet - Marauders rejoice! December 21st has past and the world did not come to an end, shocking I know. When I first saw the 2013 Bell Rogue Helmet, scenes from The Road Warrior popped into my head. This would have been the perfect helmet to outfit your post apocalyptic motorcycle gang with to cruise the waste land scavenging for gas. However the new Rogue isn't just for intimidation, the "Muzzle" is adjustable for fit and removable if you desire to clean it. The liner is removable as well and washable, since hygiene is important even to marauders. With 4 colors to choose from (Black, Matte Black, Army Green, and Gunny) it should match any preppers bug out gear. This is an interesting addition to the Bell 2013 helmet line up. Even though the world did not end, the Bell Rogue will look impressive with any cafe bike or two wheeled death machine.